Offer only the best heat trace systems & ice dam solutions to your customers. SnoFree™ heated roof panels are your effective & easy-to-install heated roof solution. Safe, attractive, and effective heat trace systems for residential and commercial applications. Having Problems with Destructive Ice Dams? Ice can wreak havoc on homes and businesses if left unattended, but you can be proactive and protect your investment with effective heat trace systems from Heat Trace Specialists. Looking for a cost-effective and easy-to-install heat trace system for your residential and commercial customers? 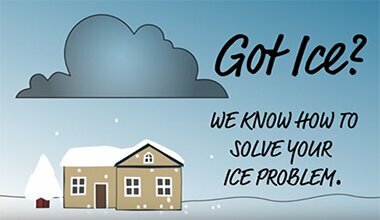 You’re in the right place, learn more about our comprehensive solutions to keep your customer’s roof ice-free all winter. If you’re a do-it-yourself homeowner, you can easily combat snow and ice issues all winter long using our easy-to-install heat trace systems. Learn more about our temporary and permanent solutions or get an installation tutorial. Roof and gutter solutions for any climate. Safe, affordable and energy efficient. Walk heating mats melt show on contact so snow and ice never have the chance to accumulate.